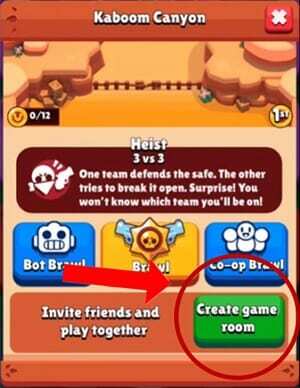 What is Game Room in Brawl Stars? Game Rooms are a huge part of Brawl Stars. They allow you to play with people of your choosing, so you don’t have to face the risk of being with an AFK player or some trash noob. Not only do game rooms make the average game play much more enjoyable, but it is much easier to go on huge grinds if you find the right strategy to use with your friends (or acquaintances, frienemies, rivals, friends with benefits…who am I to judge). Today I’ll be discussing all of the components of game rooms. This guide is pretty simple and mostly intended for newer players, but it may contain some components that surprise you. 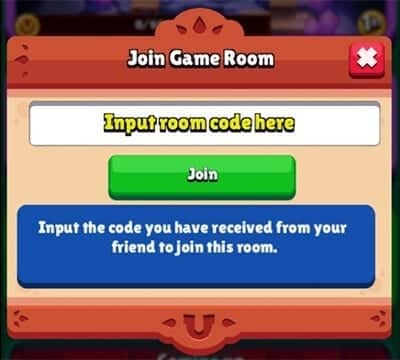 What is a Game Room in Brawl Stars? A game room is exactly what it sounds like – you can create a little “room” where you join online matches with people you know, rather than being teamed up with random noobs. Game rooms can hold 2 or 3 players. They are not supported for the Showdown game room. 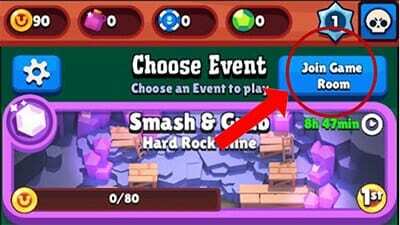 To create one, click on an event and then click on the button that reads “Create Game Room” to the bottom right of the Brawl button. Once in a game room, you can share it with people you know in one or both of two ways. 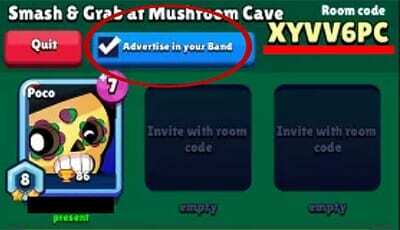 The more simpler way is to click “Advertise to Band”. This method does require people to actually be online in your band, and willing to join you. At the moment, since the advertisement doesn’t say which event the game room is in, you’ll probably want to type that in chat. The other way is to share the game room code manually. The code consists of numbers and letters, and it shown in the upper right corner of the screen (see picture above). If you click on it once, information will appear. Click on it again to copy the code to your keyboard. To join a room, click the blue button “Join Game Room” in the upper right corner on the main events screen. Once clicked, enter the given game room code. Since there is no paste option, you’ll have to memorize the code or look at two different devices to type it in (voice chat works too, obviously). If it says invalid game room code, double check that you copied down the code correctly – you probably didn’t. To start the match, click the “Ready” box in the bottom right. Once it has been selected, it will be checked. The game starts once all players in the room are ready. 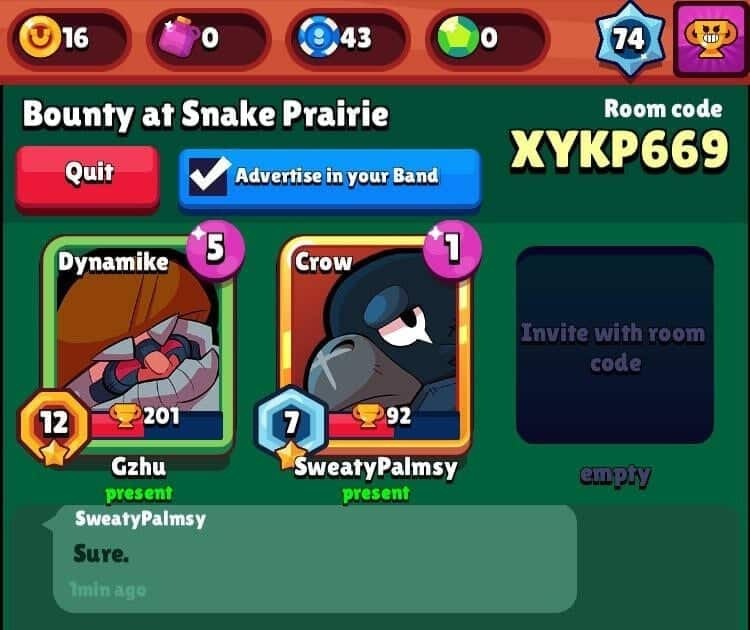 You cannot start the game with multiple of the same brawler. Change your brawler by clicking on yourself. 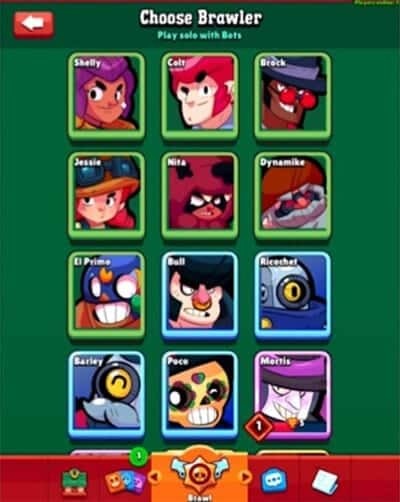 It will bring you to the following screen, where you can select which brawler to brawl with. Once you have pressed ready, you cannot switch pages, view your profile, quit the game room, or do anything that moves you to a different screen. Don’t log off at this point, because the game can still start if everyone presses ready, and you’ll be letting your team down. 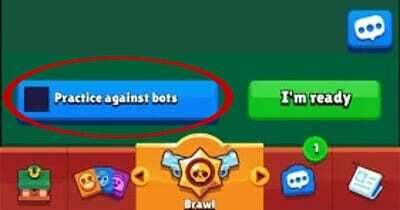 You can select to practice against bots if you wish (picture above). Only do this if your entire team agrees, because trust me – it is pretty infuriating if you don’t want to play bots. While in the game room, there are different status markers. These are displayed right under your name. Here are what each of the indicators mean, and how to react to them if you want to start a match. Present – This means they are currently viewing the game room screen. If their status says present but they aren’t talking or pressing ready, it probably means they’re afk. Other Screen – They are currently viewing another screen; most likely band chat or checking their brawlers. If you are in their band, try typing in band chat to ready up. In Battle – If you come out of a match and your teammate’s status reads in battle, it means they are still on the screen after a battle ends. If they are on this for over 30 seconds, they have left the game or are afk. 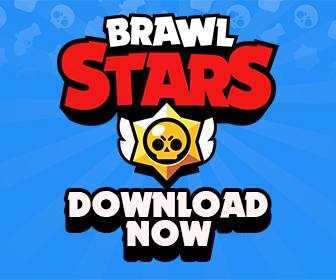 Offline – This is displayed when they player has closed the app. Unless they have bad connection, I would recommend just kicking them. Speaking of kicking, to kick someone you press their brawler and a little tab will come up that says “Kick”. You cannot kick the owner of the game room (whoever is in the first slot) unless they are offline. That wraps things up for today, folks. Game Rooms are a great tool for trophy climbing and lots of fun. I’d recommend them over a normal match any day. However, if you can’t seem to win with certain people no matter the tactics, it may just be easier to brawl with random players instead. And note that game rooms still match you against someone random – anything along the lines of a friendly battle has yet to reach the game. But we can keep hoping it does. Stay tuned for more awesome articles! "You're Prometheus, stealing fire from the gods and giving it back to the human race." Nice guide! too bad this website doesn’t get more traffic, because all of your guides have been pretty good. plus first for the first time ever! We are doing the best to make it better. Thank you a lot buddy! I promise I’ll post my 1500+ guide this weekend. I really like your guides Prometheus! They are so descriptive and explanatory and stuff.. So nice guide!